Most of my digital photography classes cover Photoshop Elements pretty much exclusively. However, I teach a photo projects class that uses Photoshop Elements, Movie Maker 2, and Photo Story 3. One of the things I try to emphasize in my class is that you may want to develop your multi-media presentation using two or more programs making use of their individual strengths and features. 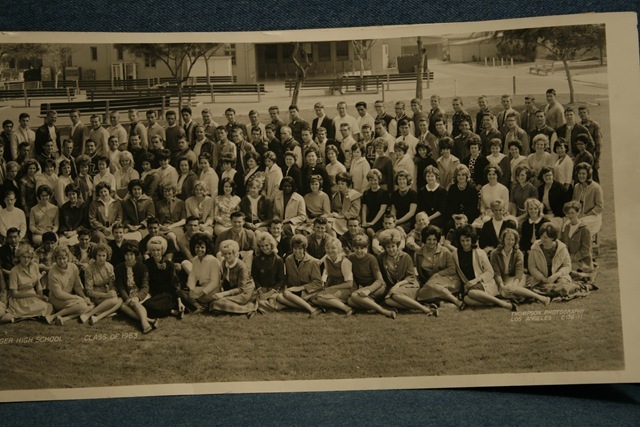 I was loaned a panorama photograph of my high school class taken in 1963. It showed some signs of wear and I wanted to get it into the computer and ultimately record it on a DVD that we could play back at our reunion next October. I shared my basic steps with my class, and decided it might have some value posting them here. Since, the panorama was too large and would require it to be scanned in sections, I decided to use my Rebel XTi to capture the image. I really did not take a lot of pains taking the pictures. I leaned the photo against the back cushion of the couch, put my camera on a tripod and quickly took three overlapping images. An Example of one of the images is shown below. I then used the Photomerge Panorama feature of Photoshop Elements 6 to stitch the pictures together. Staying with PSE 6, I cropped and straightened the picture. Then I used primarily its LEVELS command to adjust the brightness/contrast and finally sharpened it using the UNSHARP MASK command. The final image size was 7200×1846 pixels. I had to reduce the size slightly from its original size, because 7200 pixels is the largest dimension Photo Story 3 allows. Although, PSE 6 has a very capable slide show editor that includes a pan/zoom capability, I wanted to do my pan and zooming with Photo Story 3, because of its ability to handle large image sizes allowing me to really zoom in on the panorama. It is a bit more difficult to continue a pan/zoom from one image to the next in Photo Story 3 than in PSE 6 where you simply click to add each picture. I used eight copies of the panorama to get the zoom and pan I wanted. About the time I was beginning to put the finishing touches on my project, I received my weekly newsletter from PapaJohn. In this issue, he discussed how to make a countdown clock you often see at the beginning of a film using PS 3. His technique also included how to add images to the spinning pinwheel. After a little bit of trouble, I succeeded making my own countdown clock customized for my project. By the way, PapaJohn has a fabulous web site that not only covers Photo Story 3 and Movie Maker 2 extensively but has a wealth of information regarding related aspects of video production. I then used PSE 6 to make a title slide for my project. I used Movie Maker 6 (Vista’s version of Movie Maker 2) to assemble all of the pieces, the countdown clock, title slide, the pan/zoom of the photo itself, background music, and final panorama image, and then render the final .wmv file needed for the DVD. I used Nero to actually burn the DVD. The final photo story is about 3-1/2 minutes long. you can see a low resolution version by clicking here. Even this small size version is approximately 3.9 Mb. This was a fun project that was really not that hard. I do think I can do a better job on the background music and will make another version with different music and blending. Here is a small size version of the basic photo that I used for panning and zooming. I have just learned what my class schedule will be for the spring term at the South Bay Adult School in Redondo Beach, CA and the Torrance Griffith Adult Center. I have posted the schedule and my description of the courses on my web site at www.donstouder.com. So, if you live in the South Bay area of Los Angeles, you may want to take a look. We use Photoshop Elements in all of my classes. Registration at both schools should start in a couple of weeks or so. Please Note: I was told by a student that registration for the spring term at the Griffith Adult Center begins early Tuesday morning, February 12th. The camera classes fill up fast. You may want to call Griffith to confirm this. I also have an email distribution list for each school that I use to inform students of my teaching schedule for the upcoming term. If you would like to be added to the list, email me at donstouder@ca.rr.com and I will be glad to add you to the list. Since I keep separate lists for each school, please let me know what school you are interested in. I only send out two to three emails per semester, and I use the “blind courtesy copy”, so that no one else on the list sees your email address. In my January 10, 2008 entry I my thoughts regarding upgrading to Photoshop Elements 6.0. I began my comments with the simple answer, “It depends.” The other day a student brought in a book he had just bought. The book was Adobe Photoshop Elements 6 – A Visual Introduction to Digital Photography by Phillip Andrews. I am not really familiar with this book, but after thumbing through it quickly, it certainly holds its own against the many excellent books on PSE 6 and earlier versions. The one thing that I did notice right inside the cover was a very complete table comparing the features of all of the versions of PSE beginning with Version 1.0 through Version 6.0. In the table, Andrews also compares these same features for Photoshop CS through CS3. I was very impressed with the table and have never seen such a comprehensive list. This table should help anyone who is trying to decide whether or not to upgrade.I have paraphrased Andrews’ table below comparing PSE 4 through PSE 6. I put a couple of entries in bold type, because although the feature was in earlier versions, it was significantly improved in PSE 6. By the way, the student highly recommended the book. Click Here for the link to my summarized table. I suppose I have violated a few copyright laws, but hopefully I will not end up in the slammer for my transgression.